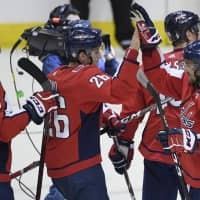 WASHINGTON - Nicklas Backstrom and Alex Ovechkin came out firing, the Carolina Hurricanes surged and the Washington Capitals showed why they’re the defending Stanley Cup champions when it mattered most. One night after watching the Presidents’ Trophy-winning Tampa Bay Lightning blow a three-goal lead and lose 4-3 to the Columbus Blue Jackets, the Capitals went up 3-0 at 18:05 of the first period and had the sellout crowd decked out in red fired up for the first playoff game in Washington since the franchise won its first title in June. 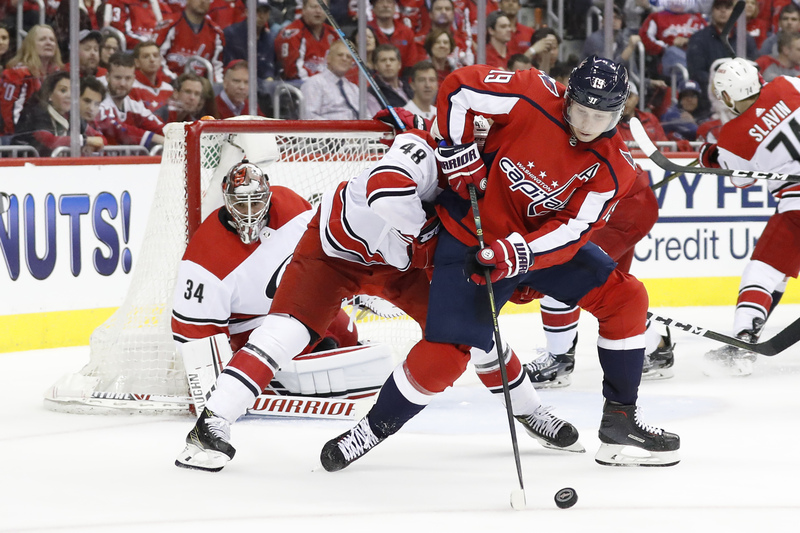 The Hurricanes took it to the Capitals, outshooting them 29-18 and got two goals in 2:19 from Svechnikov early in the third period to cut the deficit to one. 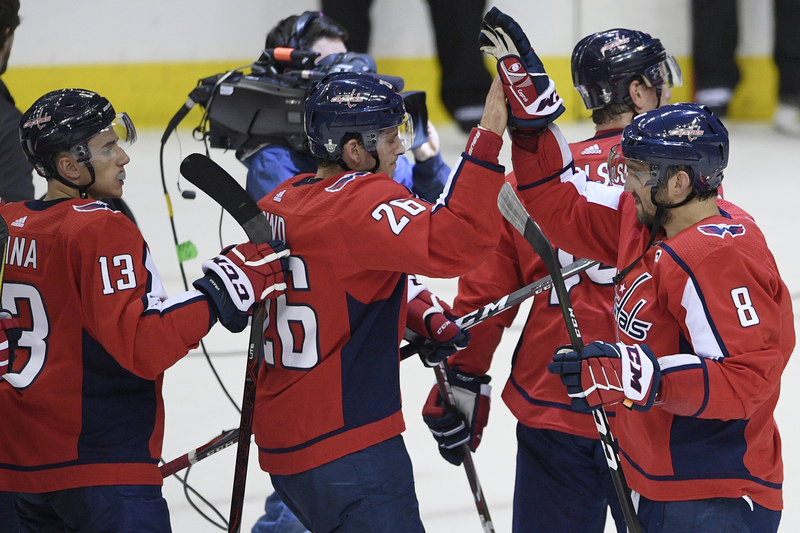 Washington, which led Columbus 2-0 in each of the first two games of last year’s playoffs before losing 4-3 and 5-4, had those experiences and the Lightning’s loss on Wednesday fresh on its minds. Another three-goal comeback almost happened in this one. Well after the “Back-to-back!” chants faded into nervous silence, Hurricanes goaltender Petr Mrazek rebounded from allowing a soft opening goal to Backstrom by stopping Nic Dowd and Carl Hagelin on breakaways and turned aside Brett Connolly and Lars Eller on rapid-fire chances early in the third before Svechnikov got the Hurricanes on the board. Mrazek finished with 14 saves. Svechnikov became the youngest player to score two-plus goals in a playoff game since Dainius Zubrus in 1997, but Carolina failed to score on two late power plays and Eller sealed it with an empty-net goal with 36.6 seconds left. Despite the loss, the young Hurricanes go into Game 2 Saturday knowing they can go toe-to-toe with the playoff-seasoned Capitals. Carolina, which had 10 players making their playoff debuts after ending the NHL’s longest postseason drought, didn’t go away. In the Hurricanes’ first playoff game since 2009, they showed a lot of the fight that allowed them to climb the standings and get in after some early-season scoring struggles. It’s not just luck. After allowing two goals to Svechnikov he believes he should have stopped, Holtby was there to backstop the penalty kill after a hooking call on Jakub Vrana and a high-sticking call on T.J. Oshie threatened to push the game into overtime. In Boston, Mitch Marner scored twice, the second on a short-handed penalty shot to give Toronto the lead for good, and Toronto won the opener of the first-round playoff series. It was the Maple Leafs’ first postseason penalty shot in 20 years. Tuukka Rask stopped 29 shots for the Bruins, and Patrice Bergeron scored a power-play goal midway through the first on a pass from Brad Marchand. In Calgary, Matthew Tkachuk scored twice, Mike Smith made 26 saves for his first playoff shutout in nearly seven years, and the Flames blanked the Avalanche in their series opener. Rookie Andrew Mangiapane and Mikael Backlund also tallied as Calgary won its first playoff game since beating Anaheim 4-3 in overtime on May 5, 2015.